This delightful mountain hideaway, only 90 miles north and west of NYC, is a stone's throw from the historic community of Cragsmoor and its 4,880 acre nature preserve, Sam's Point, with its hiking trails and beautiful views of the Catskills and the Hudson Valley. It is also only a 5 minute drive down our mountain, Mt Meenagha, to Ellenville where you can find restaurants, live theatre, vegetable stands, shopping and other town amenities. You can roll out of bed and walk along the historic 'Carriage Walk' at the top of Mt Meenagha with its beautiful views of the Shawangunk Ridge. The house, furnished with antiques, can sleep 4and has 1.5 baths. Charmingly built into a slope, the house has three levels: a full bedroom with wainscotting on the top floor; living room, queen bedroom and twin sleeping alcove with full bath, (all with hardwood floors,) on the main level; and den with wood burning stove, dining room with many windows and a skylight, and a fully equipped kitchen, (all with Mexican tile floors,) on the lower level. There is an airy sunroom with skylights and bamboo floors right off the kitchen leading into the garden. The house has all cotton linens, quilts and down comforters in addition to the antiques and artwork. There is an outdoor stone patio, a deck with picnic table and a charcoal grill. While completely secluded on its own private road in the woods, the house sits on 2.5 acres with plenty of sun and an array of solar panels that feed into the electrical grid and supply the house with its electricity. Built in the 1930's, the house retains its unique charm and at the same time offers modern kitchen appliances (with plenty of room and utensils to cook up gourmet meals,) electric heat, wireless internet and Direct TV. A wide variety of activities are close at hand, from some of the best hang gliding, rock climbing and hiking you may find, to the beloved Cragsmoor Library and Old Stone Church, both hosting many community and cultural functions in Cragsmoor, a 5 minute drive through a mountain ravine on S. Gulley Road. In addition, Ellenville is proud to have the premiere Shadowland Theatre and right next door to it, the terrific Aroma Thyme Bistro serving up an array of fine foods and live music. 30 minutes from Minnewaska State Park with its trails and lake swimming, 45 minutes from New Paltz and Kingston with their many restaurants and shopping, there is so much to explore in the Shawangunks. Come and get away from it all in this unique Hansel and Gretel house in the woods. Enjoy its serenity and views as you walk its hiking trails. Cook up some special meals with the local produce and dine al fresco, or, just spend the day relaxing with a book. Come and share in the timeless magic of the mountains. My husband grew up summering in the Catskills with his family so when we wanted a complete getaway from NYC where we lived and worked we came looking here. When we drove by the stunning Shawangunk Ridge and the luxurious natural beauty that surrounds you here we were hooked. Discovering the unique historic community of Cragsmoor with its rich artistic history right next door to this property was an unlooked for gift! So close to New York and yet so far away in spirit, we fell in love with the Shawangunk Ridge. Each season brings its own unique beauty, from the enchantment of spring and its newly minted greens and many blooms, to the warmth of summer, (which where we are is very rarely too hot,) to the breathtaking richness of the autumn foliage and the deep stillness of a winter landscape, we are continually amazed by the everchanging views, moods and light of this mountain area. This charming house is uniquely set on the side of the mountain with its own patio, mountain stream ( in spring) outbuildings and solar panels. It is completely private and quiet and in its own world. It has many different rooms and places to relax, peaceful and various at the same time. Everyday brings new delights, and often starts in the morning with a walk around the mountain 'Carriage Walk', a path left from the days when the old big hotels attracted New Yorkers, like ourselves, and they walked or rode in their carriages around the mountain. The day may close with a delicious dinner in town or outdoors by candlelight! The drive can easily accommodate 3 cars. House supplied with paper towels, tablecloths and cloth napkins, some spices, tea and coffee and other sundries. There is a stone patio with table and 4 chairs. Lovely, surgically clean cabin in idyllic setting. Not the best WiFi and the water source has a wiff of sulfur. But you shouldn't be working up here. Lived sitting back and listening to the stream roll along. Just beautiful experience. Super close to Sam's point and verkeerder falls. If you love nature, this is the place. 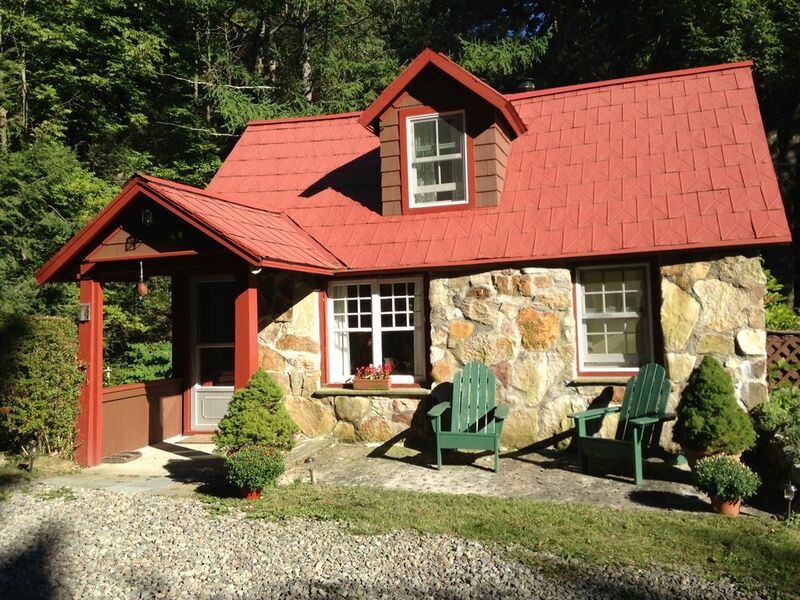 Great stay at this adorable cottage nestled into the mountainside complete with a babbling brook. We experienced heavy rain and snow squalls, but stayed nice and warm in mid-November. The cottage is well equipped and has everything you will need for a comfortable stay. Close enough to Ellenville to easily stock up on food or go out to eat. The cottage is off the beaten track so if you want peace and quiet this is the place for you. It was a lovely home, enjoyed our weekend away immensely! Relaxing getaway home with all the amenities. Loved the inside as well as the pretty grounds. My wife and I had a great time. Monique was responsive to our questions, and the house/property was exactly what we were hoping for. We'll be back! Really easy VRBO experience overall with a lovely, quaint home in a truly picturesque setting. Proximity to Sams Point is awesome. We had a lovely weekend here! This quaint and secluded house was just perfect for us. It was great being able to walk out the door and hike and explore the beautiful surroundings. We also really enjoyed spending time in the sunroom on a rainy afternoon and watching the deer in the backyard. Situated between the Catskill Mountains to the northwest, and the Hudson Valley to the east, hiking or driving the Shawangunks offers spectacular views of both. Engaging in any number of sporting activities during the day, like hiking or swimming in Minnewaska State Park with its many trails and lake or visiting the Mohonk Mountain House, or the adjacent nature preserves in Cragsmoor (Sam's Point or the Bear Hill Nature Preserve,) and then dining out at Aroma Thyme Bistro in Ellenville followed by a show at Shadowland would make for a very full and satisfying day! There are many sporting activities, hang gliding and rock climbing, as well as activities for more leisurely days like visiting local farmers markets, antique stores, wineries and, in general, visiting the small towns and shops on the lovely winding roads. Rates are for 2-3 people. It is $15.00/night extra for 4-5 people.